For most visitors to the region of South East Asia, countries like Vietnam and Thailand call louder than most. While visiting these countries is in itself an adventure, and Thailand itself is a great bridge between East and West, many people seem to ignore the regional (and border) neighbour, Laos. Laos is still a communist country with a rich history and a welcoming hospitality that cannot be beat in the region. Read ahead to learn more about this usually overlooked country and why you should consider going the next time you’re in the area. 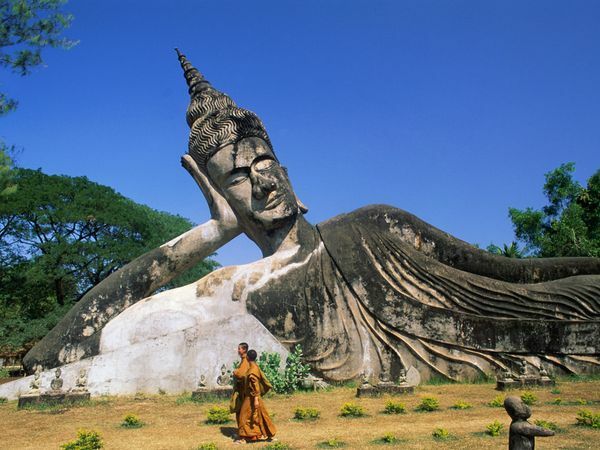 The capital city of Laos, Vientiane, is a curious and growing collection of East meets West. While not quite Bangkok, Vientiane boasts several chain restaurants and even a Dairy Queen. All of this is set alongside beautiful and elegant temples clad in gold and bejewelled statuary and conveniently placed right along the Mekong river which has in recent years undergone a bit of a development push to create a promenade that comes alive after dusk with a night market to rival some of the best markets in the west. For a unique experience, hire a tuk-tuk to take you out to the Buddha Park, a collection of various Buddha statues all created by one single man as an homage to Buddhism. Roundtrip costs about $30USD from Vientiane, and includes the tuk-tuk driver waiting for you. From Vientiane you can arrange a mini-bus or van to take you up to the beautiful, secluded, quiet rural village of Vang Vieng. Set in a valley along a smaller river, Vang Vieng played host to the Americans during the Vietnam war as a refuelling outpost and still has the runway from this era. Surrounded by beautiful karst mountains, home to caves, Vang Vieng is perfect for both the adventurer and those who like to just kick back on the patio with a frosty Beer Lao to relax in the sun. Plan to stay for a few days at least – it’s easy to get stuck here. UNESCO World Heritage City, Luang Prabang is arguably the jewel of northern Laos. With dozens of temples and the Nam Ou River cutting through the city, this is a place that really brings home the hospitality and beauty of Laos. Set in a portion of the northern mountains, the city enjoys cooler weather than Vientiane or the South, and so is a great place for many people to seek respite from the heat. Stay a few days and wander the huge night market that comes alive every night at sunset at the base of Mount Phousi, which is conveniently perfect for sunset snaps over the mountains and river. These days with Luang Prabang being so popular it’s become very much a tourist hot spot, so those who are seeking a more “authentic” experience, plan to head up river to the smaller rural village of Muang Ngoi, but the word is out about Muang Ngoi, so expect it to boom in the coming years as people seek out more authentic rural Laos. For the travel-hardened, the South of Laos provides a real experience. Villages where you’re lucky to find a guesthouse are the norm and sometimes you have to stay with locals who open their homes to visitors. It’s much wilder down here, but likewise it’s a much more accurate depiction of real Laos. Cities like Thakek and Savannahket welcome travellers who like to break up the journey to Pakse and onward to the 4000 islands, a beautiful piece of southern Laos which acts for many as gateway to Cambodia. There you have three places in Laos to help you plan your journey. It’s a wonderful country, with beautiful natural scenery and fantastic people who welcome you to Laos at every turn. With so much to see and do here it’s easy to need to extend your month long visa. Plan for two months if you aren’t on a strict schedule – you will probably find you need it!